The hypervisor mechanism is a fundamental part of virtualization infrastructure that is primarily used to generate virtual server instances of a physical server. 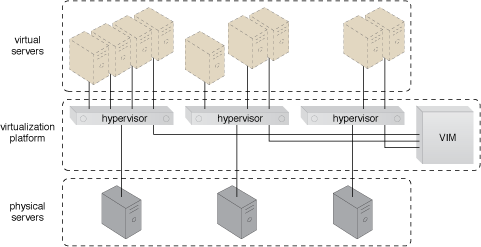 A hypervisor is generally limited to one physical server and can therefore only create virtual images of that server (Figure 1). Similarly, a hypervisor can only assign the virtual servers it generates to resource pools that reside on the same underlying physical server. A hypervisor has limited virtual server management features, such as increasing the virtual server’s capacity or shutting it down. The VIM provides a range of features for administering multiple hypervisors across physical servers. Figure 1 – Virtual servers are created via individual hypervisors on individual physical servers. All three hypervisors are jointly controlled by the same VIM. Hypervisor software can be installed directly in bare-metal servers and provides features for controlling, sharing and scheduling the usage of hardware resources, such as processor power, memory, and I/O. These can appear to each virtual server’s operating system as dedicated resources.